REMINDER TOURNAMENT IS FOR FUN!! penalties will result in point deductions and fighting is not tolerated...you will be out of the Tourney, as soon as I get the updated rules I will forward them to you. Games friday night, arena lounge open till midnight...party! Games saturday...and Dinner served in the arena lounge, Pizzas, salads and desert. We are looking at serving the food by 6pm. Space in the lounge is limited but if you need an extra dinner ticket we will have them available for 15.00. Then we will party at the lounge and have our raffles (autographed NHL hockey Jersey TBA) etc until 11 or 12 midnight and then head to the Flying Steam Shovel to see Kathy Kolar's band from Salmo. We will have a SHUTTLE lift home for 5.00 per person at the end of the night FROM the SHOVEL that will go to Trail and as far as Fruitvale, YOU MUST SIGN UP FOR IT on Saturday in the lounge if you would like a ride, first ride at 12 or 12:30 depending on who signs up for when and for where.. let me know if you have any other questions. If anyone has anything they would like to donate to be added to our baskets to be raffled off please bring it... ALL $ goes to Charities including Carol Enns and our Scholarship, thank you!!! Thank you to Kathleen for taking this years team photo! 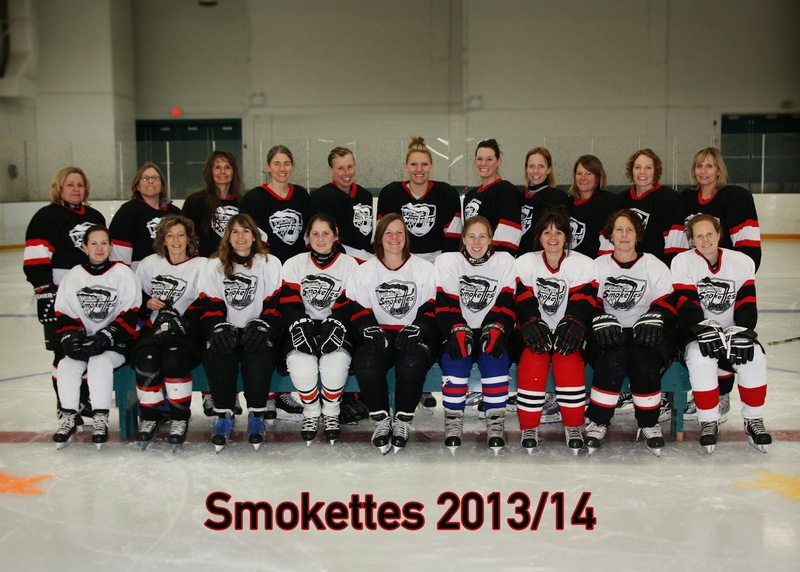 Hello Smokettes, Please let me know if you will be able to play during our tournament. I will be the one making the players list for our games. Friday 0850 PM, Sat 0240 PM, Sun 0115 PM. Hi Ladies, so Barb has completed the tourney schedule!! great job Barb!! and thank you for all of you time you spent doing it! Now you can see when our games are going to be... and we usually play two out of the three games. So in addition to signing up to duties during the weekend if you want to play you must sign up for the tournament to play and pay (we will let you know how much that is, tba). You may not get to choose which games you play but if you know for sure that you are unable to play one of those games please put a note by your name... you could prob switch if you had to later, but we will try and keep the teams pretty even. Also if you have any interest in playing all three games for Grand Forks they may need a couple skaters... The sign up sheets will be at hockey... if you can not make it to hockey to sign up but still want to help let me know and I can direct you to who has them. Nelson Tourney March 21-23 - Interested? Hey Ladies, Just got this email from Nelson Drillers... I am not say we are or are not going I just want to see who is interested... let Kari know if you would like to do Nelson? we do have every Saturday in March at 11:30 in Trail as well. Our spring tourney is coming up – trying to get things organized for this…had to wait for the men’s team to decide what they were going to do…so. We are going to organize both men and women’s teams for this tourney. Please forward to your spouse/partner’s team contact so they can join us. I need to confirm how much ice we will need for this awesome tournament. Friday night & Saturday and night – beer gardens’ in the curling club – crawling distance from both rinks. The main rule for the men’s teams is it is a 35+ tournament so very strict on that rule! Any questions? Looking forward to it! !